Zuzka Light has some of the best abs on the internet. Build your own killer six with this intense, fat-burning workout and her excellent nutrition advice! You can find good information about the right diet and training all over the Internet. Bodybuilding.com alone is home to thousands of articles dedicated to nutrition and abdominal training. The biggest secret to achieving rock-solid abs is not so much in what you know about training and diet, but what you do about training and diet on a daily basis. The difference between people with a six-pack and those without is a matter of long-term commitment and daily dedication to training and diet. If you're not 100 percent dedicated to intense training that burns fat and builds muscle, along with a rock-solid nutrition plan, you'll never see your abs. You need both parts of the equation. I can't make the commitment for you. That's something you'll have to figure out on your own. But I can help you with your training and nutrition. In this two-part series, I'll guide you through short, intense, ab-training workouts that you can do with minimal equipment, and share some of my best diet tips! I want to help you build a body you're proud of! All you need for this workout are a jump rope, an exercise mat, and medium-sized kettlebell. 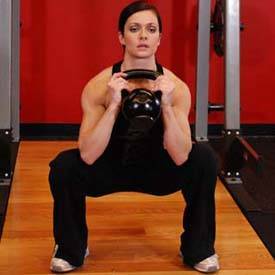 If you're a woman and new to fitness, I suggest you start with an 18-pound kettlebell. If you are a strong woman, grab a 26-pound kettlebell. If you're a beginner or average guy, start with a 35-pound kettlebell. If you're a strong or advanced guy, use a 44-pound kettlebell. This workout is only 15 minutes long, but it's brutally intense. Have fun and try to push yourself way beyond your comfort zone! Don't stop until the 15 minutes is over. When you've completed 15 minutes, make sure to write down how many rounds and reps you achieved. The next time you do this workout, try to beat your score. In order to enjoy visible abs, you have to maintain a fairly low body fat percentage. A woman's body fat percentage would have to be below 18 percent. For a man, abs typically appear at less than 10 percent. In order to enjoy visible abs, you have to maintain a fairly low body fat percentage. I know these numbers seem pretty difficult to achieve, but the good news is that this type of lifestyle is easier than you think. I work out for less than an hour a week, I enjoy my food, and I maintain visible abs all year! I suggest starting with the biggest and most basic nutritional change you can make: cut out all sugar from your diet and lower your overall carbohydrate intake. Sugar can be very addictive, so it's going to take some time to train your body not to crave it. I avoid sugar at all costs. It's one thing that can ruin everything. It's not good for your skin, your mood, or your abs. I don't eat chocolate or ice cream. If I bake something, I don't use sugar. I use agave or natural sugar substitute. Train your body not to crave sugar. Cut out all sugary treats, honey, maple syrup, cereal, yogurt, low-fat dairy, bread, pasta, and fruit high on the glycemic index. Stick mostly to veggies, meat, poultry, fish, eggs, full-fat dairy, nuts and seeds, and fruits low on the glycemic index. There is nothing wrong with having a sweet potato, some quinoa, or a slice of whole grain bread, but I always make sure to earn those treats with a high-intensity workout. I try to eat these higher-carb foods within two hours of my workout. It helps me keep my body fat percentage low and my cravings satisfied. Cut out all sugary treats, honey, maple syrup, cereal, yogurt, low-fat dairy, bread, pasta, and fruit high on the glycemic index. The trick is to create a plan that you can follow as a lifestyle. Build a nutrition plan with foods that you like to eat and that will keep you lean. Stay committed to this lifestyle and you can maintain permanently low body fat percentage! Keep checking back for part two of my six-pack secrets series. I'll give you more nutrition advice and another bodyweight workout that you can take with you anywhere! In the meantime, visit my website where you can find all of my workouts, recipes, and blog posts! Start living a healthy lifestyle and get that badass body you've always wanted!Order Now! Zuzka Light is a leading fitness personality on YouTube, fostering an audience of hundreds of millions of viewers worldwide.